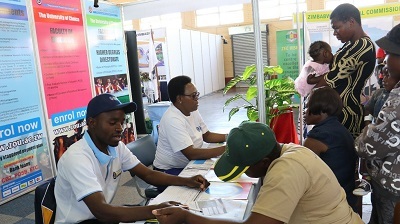 The Zimbabwe Open University (ZOU) exhibited during the 2018 Harare Agricultural Show held at the Harare Agricultural Showgrounds. The theme of the show, the 108th Edition of the annual showcase, was “Field to Industry. PRODUCE.CONNECT. DEVELOP”. ZOU exhibited under the theme “Developing Industry’s Human Capital Needs Through ODL”. The University of Choice, ZOU, showcased its reach and academic products and services, which are tailor-made to empower the world through high quality open and distance learning enabled by technology. The majority of people who visited the ZOU stand showed great interest in the Open and Distance Learning mode that is the hallmark of ZOU’s learning delivery system. The requirements for one to enrol with ZOU, low tuition fees and the flexible fees payment plans endeared the University to the attendees. However, most of the people called for the introduction of Master programmes in Psychology, Banking and Finance, Accounting, Media and Communication.